Soft roti with any curry and sabzi makes a satisfying meal. Here are few tips to make soft fluffy roti. 1. Select good quality wheat flour. 2. Knead the dough using warm water and oil. 3. For health reason if you do not wish to use oil then use milk, yogurt, water left after making paneer, etc. knead the dough to make it soft and not sticky. 4. After kneading the dough, keep it aside covered with moist cloth for about 30 minutes before making Rotis. 5. When making the roti, roll rotis equally on all sides. 6. Make sure tava/griddle is hot enough and not too hot which can burn roti. 7. Put it on hot tava/griddle and let the bubbles come, then turn and bubbles come again. The press the roti with wet towel gently or moist tissue paper. Keep turning and do not let the roti sit on tava/griddle unturned longer than 30-40 seconds. 8. Remove from heat, put some butter on one side and put in box lined with tissue paper and cover with lid immediately. It will remain soft for a day. 9. 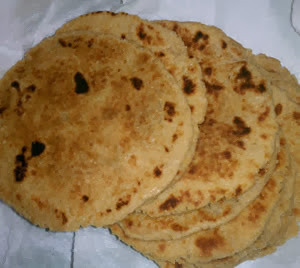 If you want to avoid putting butter, prepare rotis 30 minutes before eating and they will remain soft too. 10. You can also cover rotis with soft cotton cloth.